Do you grow flowers in the spring and summer that you just love displaying indoors? If so, have you thought about the perfect vase for displaying those flowers? How about giving your homegrown flowers as a gift and putting them in a lovely DIY vase? 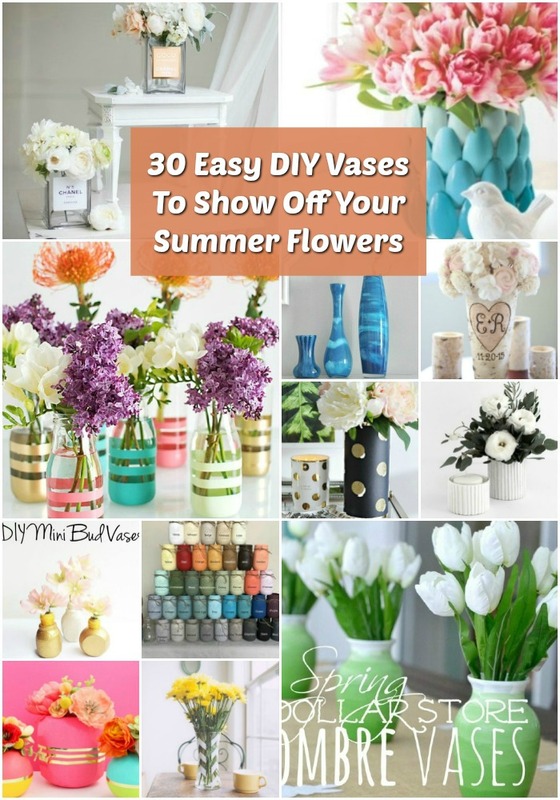 I have a great list of 30 easy to make DIY vases that will let you really show off those spring and summer flowers! All of these are simple to make, take very few supplies and can be done in just an hour or less. If you love growing your own flowers, you just have to check these out. When you bring in those prized flowers that you have nurtured yourself and grown into beautiful blooms, you really need a special vase to show them off. From modern to rustic, there are vases in here to fit every décor. And they all make the most wonderful gifts – once you fill them with your own flowers, of course. And, if you really love summer DIY projects, you should try your hand at some of these 50 fun popsicle crafts to make with your kids this summer. I really love working in my flower gardens throughout spring and summer and I love showing off the fruits of my labor even more. If you grow your own flowers, these DIY vases are a must. You can even pair them up with some homemade candles and votives to really show them off or to give an exceptional gift to someone special for their birthday, graduation or just any occasion. Pair them with some of these 15 decorative DIY candles and votives. You can make all of these for under $1! I hope you love these DIY vases and I hope that they help you to showcase those lovely flowers that you are planning to grow this year! 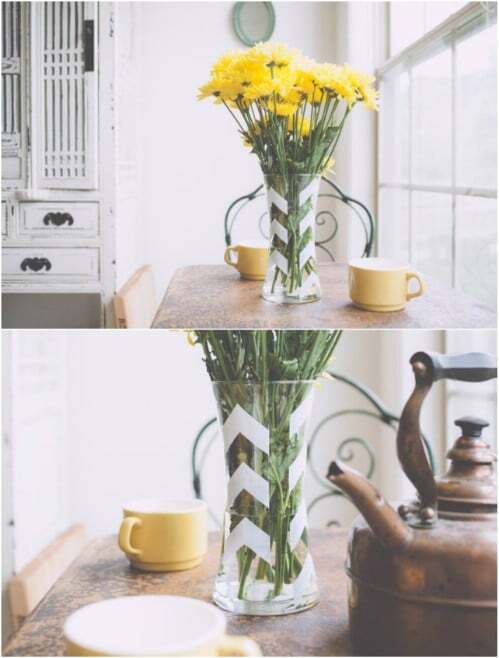 If you like a more modern theme to your home décor, these DIY geometric vases are a great choice. They are so colorful and so very easy to make. 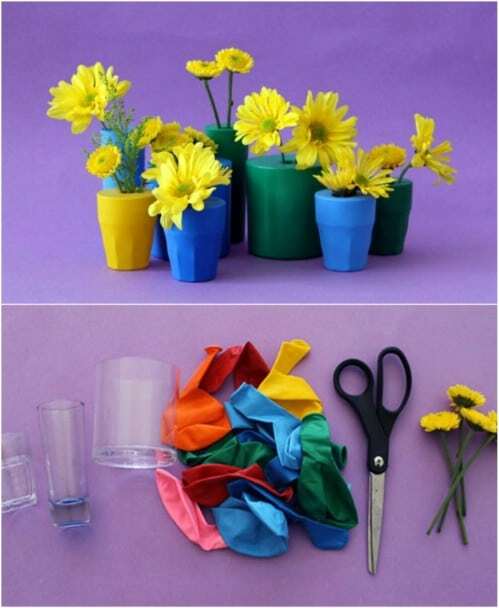 You make these from inexpensive foam balls and test tubes, which hold your lovely spring or summer flowers. These are a great choice for Mother’s Day or birthday gifts and are perfect for every room in the house. This vase, made from an empty metal can and some plastic spoons, is genius. This is a wonderful way to show off those seasonal blooms and it is so easy to make. What a great way to upcycle empty coffee cans! 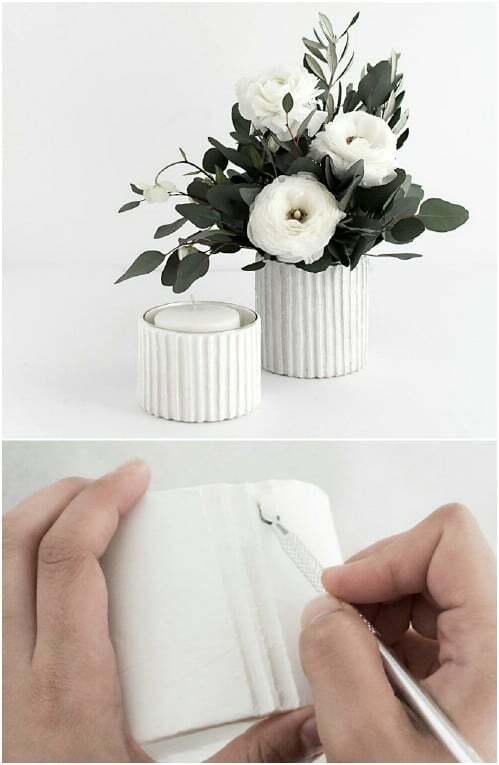 You just need a large can and a handful of cheap plastic spoons, plus some paint to make the vases the color and design that you want. I love these blooming vases from Anthropologie, but unfortunately they don’t love my wallet. These little vases will set you back anywhere from $30 to more than $60. That’s a bit rich for my blood, but you can add these DIY Anthropologie knockoff vases to your home for just a couple of dollars each. And, they look just like those more expensive ones at Anthropologie! The arrow design on this vase is gorgeous and it is a really easy one to DIY. 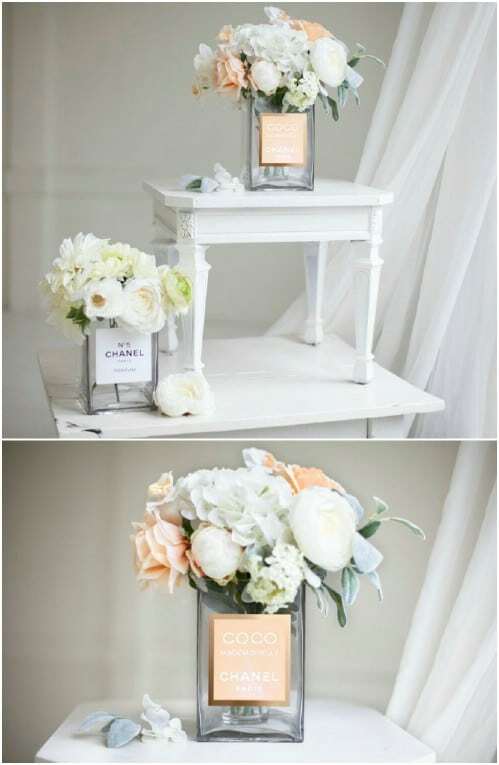 You just need a standard glass vase, or a tall clear glass, and some frosting paint. Just use masking tape to mark off your design and then spray the paint to create it. This is so light and airy. It would be perfect for showing off those lilies and other flowers this summer. 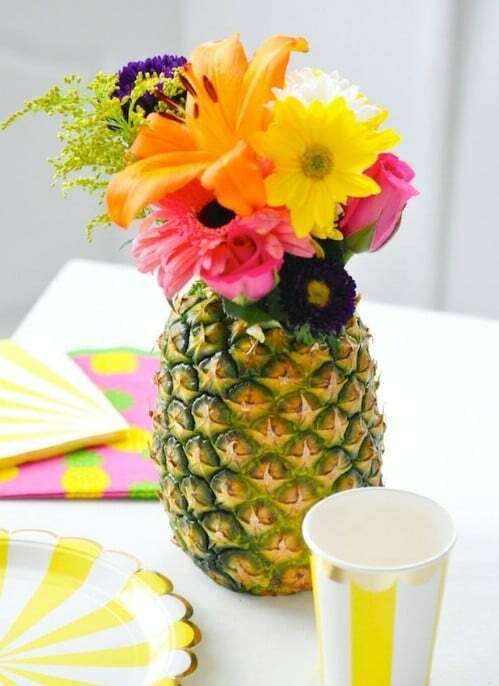 If you just need a temporary vase, and one that is definitely perfect for summer, you can just use a pineapple. If you’re planning a cookout or even your own summer luau, this is a wonderful way to show off those flowers. You can even scoop out the pineapple pulp so you’re not wasting it. Use it to create some yummy DIY summer smoothies to go along with your new pineapple vase. 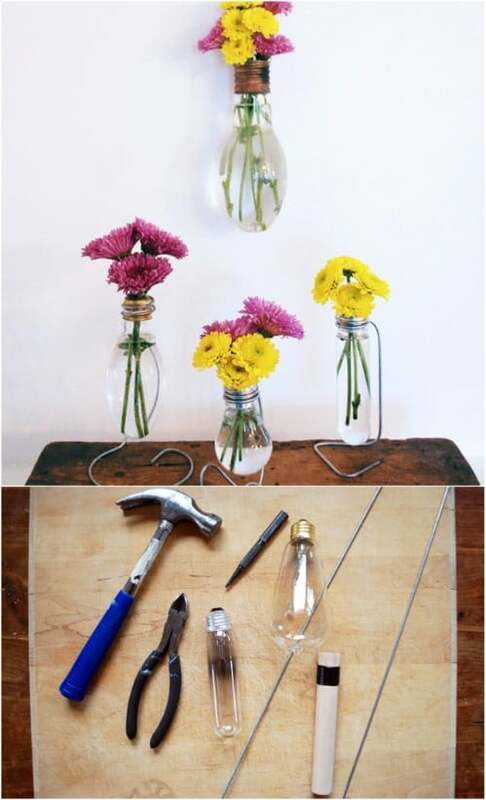 Some old lightbulbs make the perfect little vases for smaller spring and summer flowers. You can set these all up in a sturdy base or even hang them on the walls. They’re perfect for hanging out on the porch or deck and they are super easy to make. 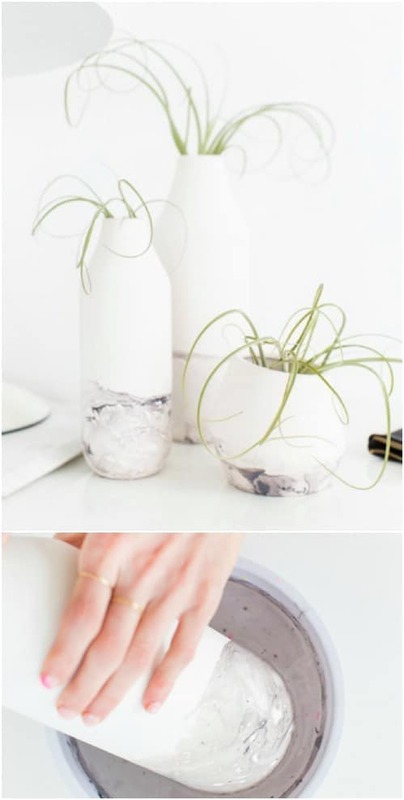 You will need to be careful about working with the thin glass, but once you have the hang of it, it’s really simple and you can put one of these adorable DIY lightbulb vases together in just a few minutes. 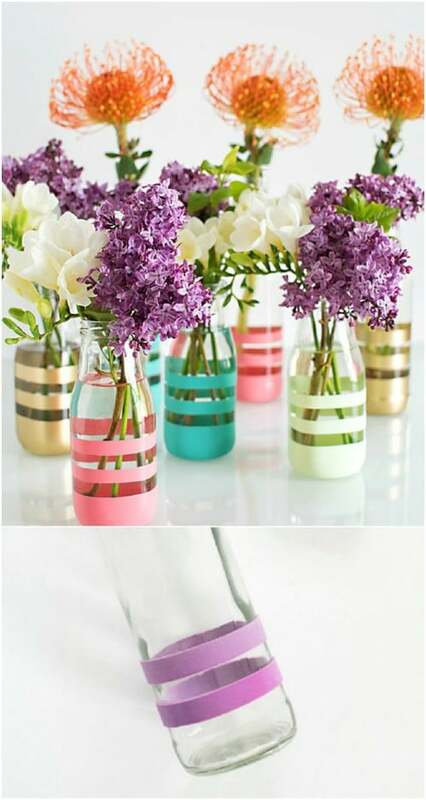 Use those glass coffee bottles – or other glass bottles – to create these colorful repurposed glass bottle vases. These are so easy to make and you could do as many as you have glass bottles available. 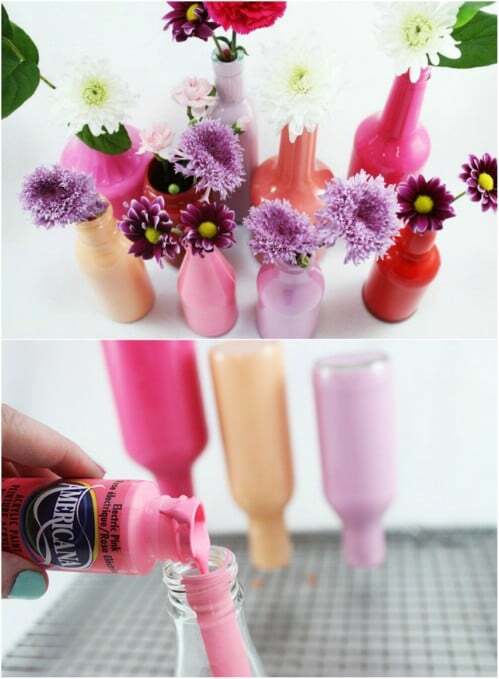 Just choose a color, or any combination of colors, and paint them to make the most gorgeous summer flower vases. I love these DIY wooden vases that are inspired by West Elm. I love the West Elm vases too, but they are a bit expensive. These are really cheap and easy to make and will add that designer touch to your home. 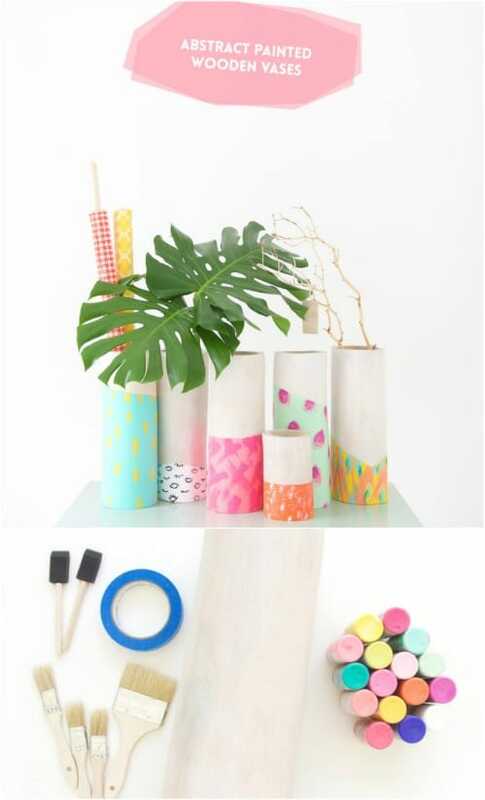 You just need some wooden vases, which you can get at any hobby or craft store, and a collection of paints in your favorite colors to make these. These Lilliputian vases are gorgeous and they are perfect for showing off those summer flowers. 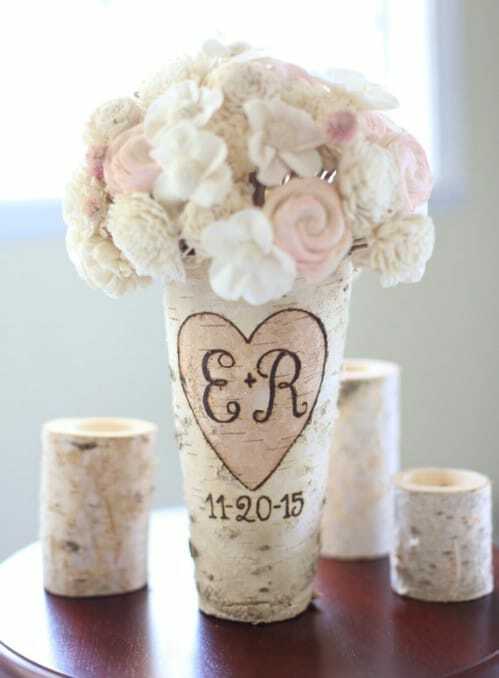 These would also make wonderful vases for your DIY wedding decorations. You just need some glass bottles or some plain glass vases and some paint. Choose the colors that you want, or match these to your existing décor. They’re fast and easy to DIY and beautiful when they are finished. 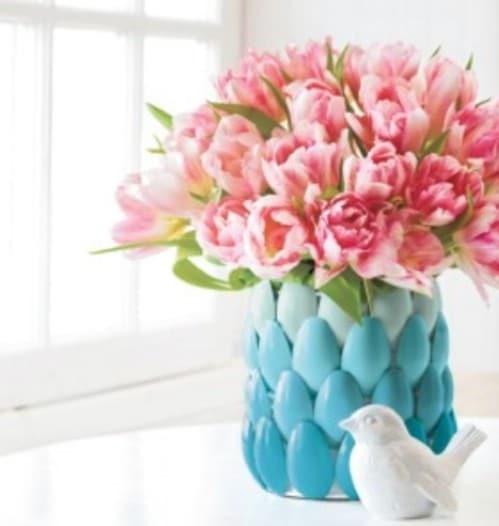 Using balloons to cover up plain vases, jars or glasses is a brilliant idea and it makes the most gorgeously colored vases. You don’t need a lot of supplies for this one, just the container that you want to make into a vase and your favorite color of balloon. 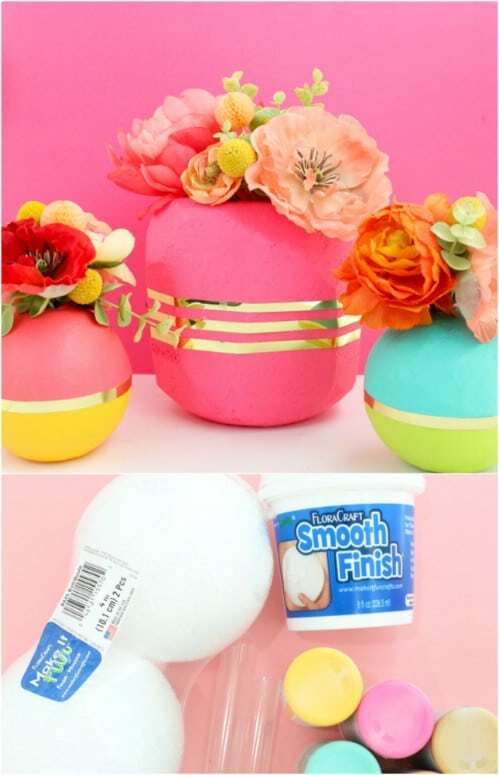 Balloons can be bought at the Dollar Store for just a dollar per pack and you get several in a pack, so you can make one of these stunning vases for everyone you know! 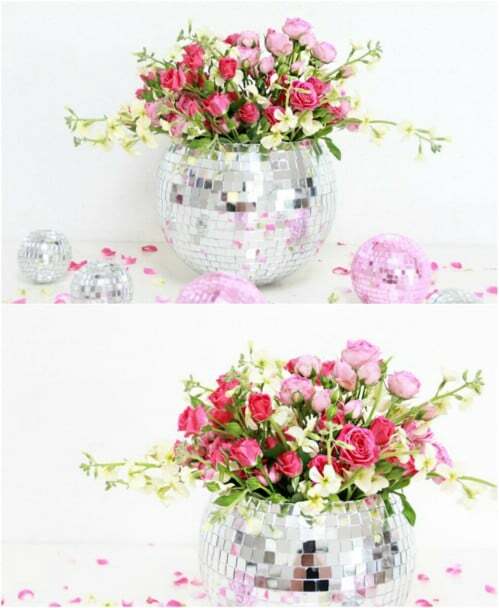 This disco ball turned flower vase is exceptionally beautiful and it’s so easy to make. You will need a disco ball for this one, but you can find them virtually anywhere online and they’re not at all expensive. You need a few other supplies for this one, as well. 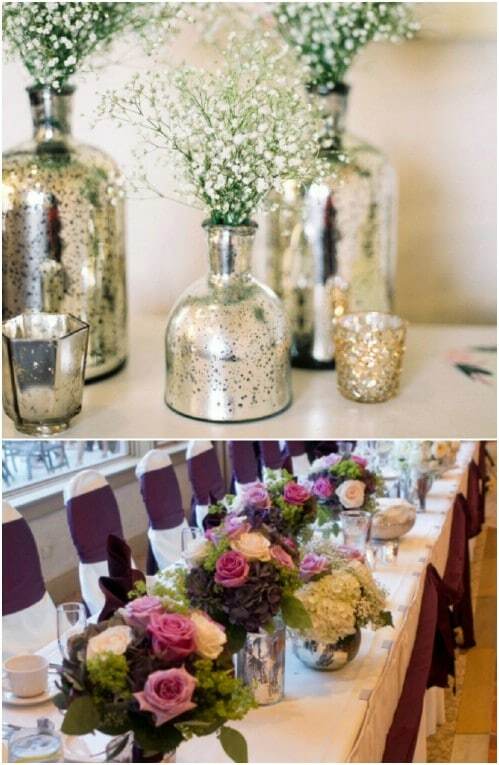 The disco ball really shows off the colors of your flowers and this is really perfect for those of you who believe disco is making a comeback! 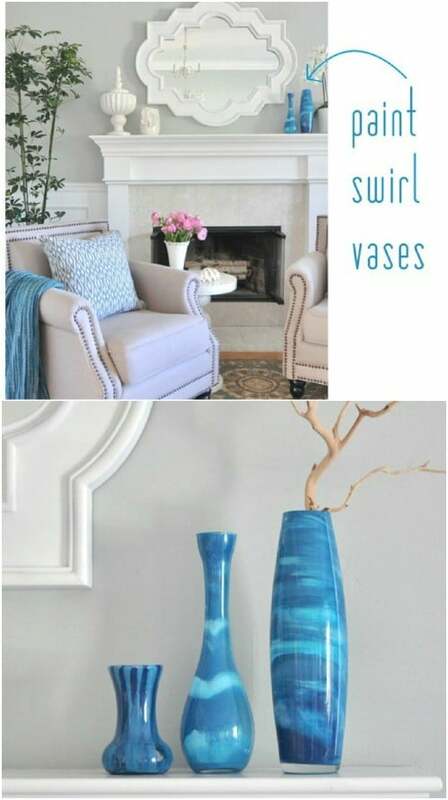 A plain glass or glass vase, a few rubber bands and some frosting paint are all you need to create these lovely frosted vases. These are super simple and take less than an hour to complete – although you do need to let the paint dry really well before adding water and flowers. They are light and airy and just perfect for those spring and summer colors. 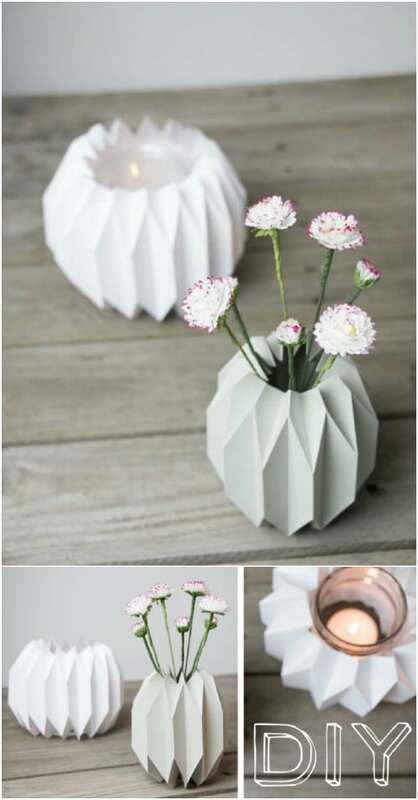 These little DIY vases look like origami and they are gorgeous. You can use these for smaller flowers – shorter stems – or make them larger if you want to hold those daylilies and other taller blooms. The geometric shape will help to balance out your room and the white color is perfect for highlighting all of those colorful flowers from the seasons. I love Kate Spade products, like these polka dot vases. But, these particular vases cost upwards of $80 apiece. I can’t justify spending that much money on a vase, so I choose the DIY way. 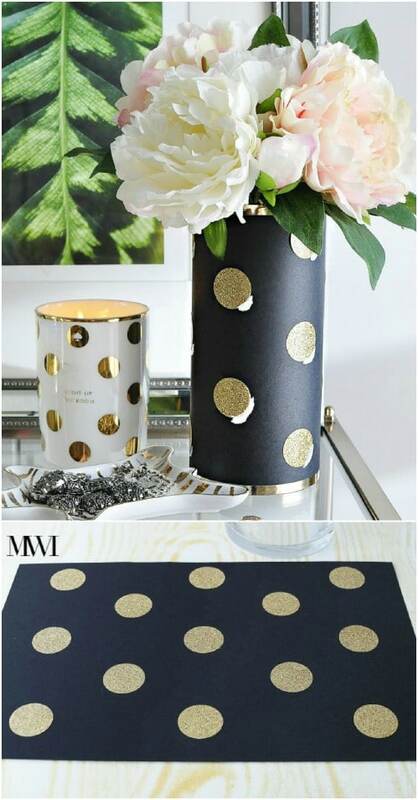 These Kate Spade inspired glitter polka dot vases are so easy to make and they look just like the ones at your favorite department stores. You’ll save a fortune making them yourself and no one will know that they aren’t authentic Kate Spade vases. Some old mason jars, or mayonnaise jars or whatever you have on hand, can be turned into the perfect vases for summer flowers with just some lace, burlap and other items. These are great for that DIY farmhouse décor look and you can literally make them from any glass container. If you need smaller vases, just use smaller jars. The entire project takes only minutes to complete. There really are so many creative mason jar DIY decorating projects! Some glass vases or jars and some paint are all you need to create these gorgeous DIY marbled vases. These take just a bit of time but the process is really easy. They’re also really cheap, especially if you have a few jars or vases on hand. You just choose the paint colors that you want to work with and then get to marbling. 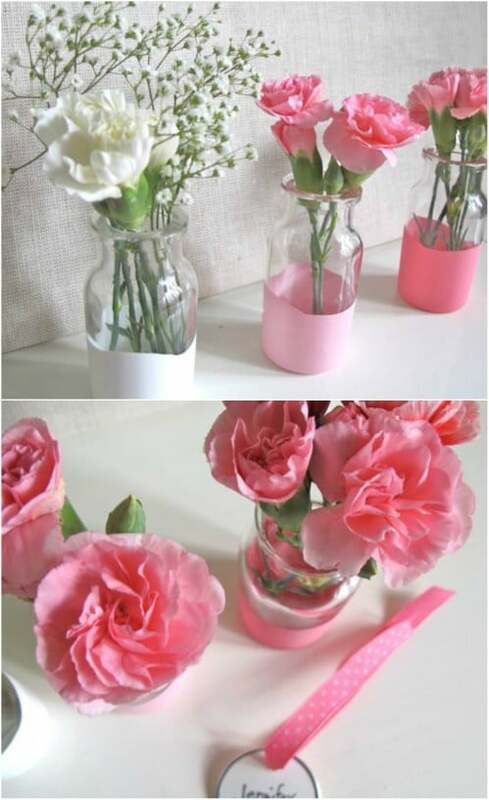 I love these mason jar vases! They are painted any number of colors and they are so easy to make. If you have a collection of mason jars, you’re halfway to creating them. They take very little time and are wonderful for that farmhouse look. I found these on Etsy and they are just $5 each, which is a great deal if you prefer to buy them already painted as opposed to DIYing your own. These textured vases are so easy to make and you can create matching candles to go with them just as easily. You use clay to texture them and you could paint them if you prefer to have a color other than white. These will definitely show off those summer flowers and you can make one in just about an hour or so. Spend a weekend creating one of these for every room – with matching candles! 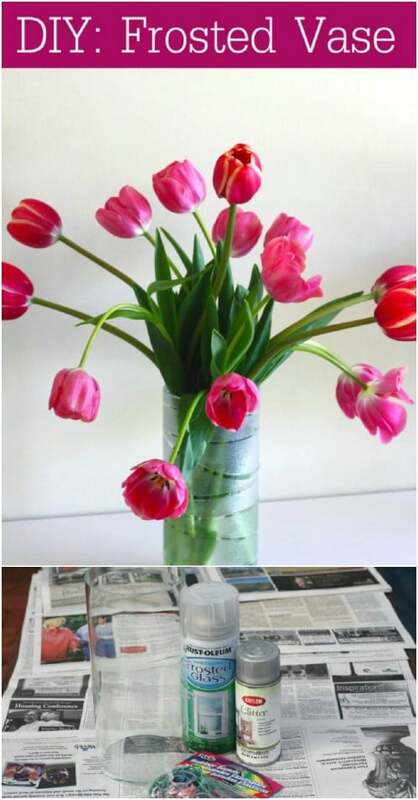 These DIY mercury glass vases are really cheap and easy to make. If you buy mercury glass, you’re going to spend a pretty penny. These however, can be made for just the price of the glass container and the spray paint. The process is really simple and they do make the most gorgeous vases for your summer flowers. These are also great as gifts or if you are planning a DIY wedding. 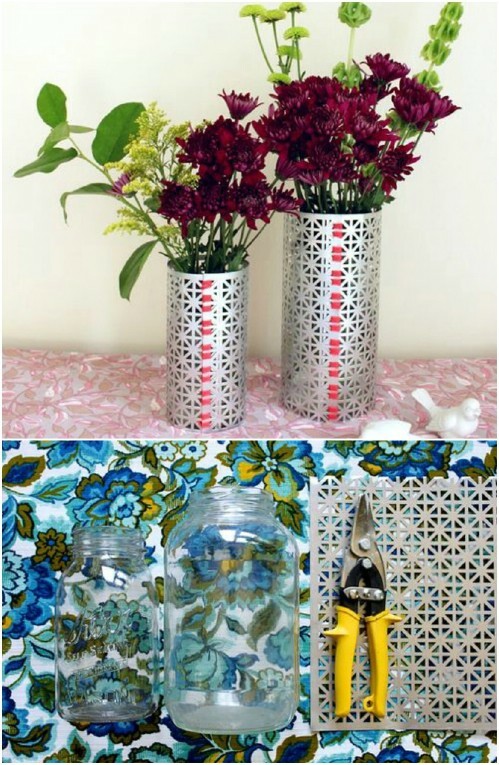 If you love a more contemporary look in your home, these DIY metal vases are perfect for your summer flowers. They look so expensive but they are really cheap to make and don’t take long at all to finish. 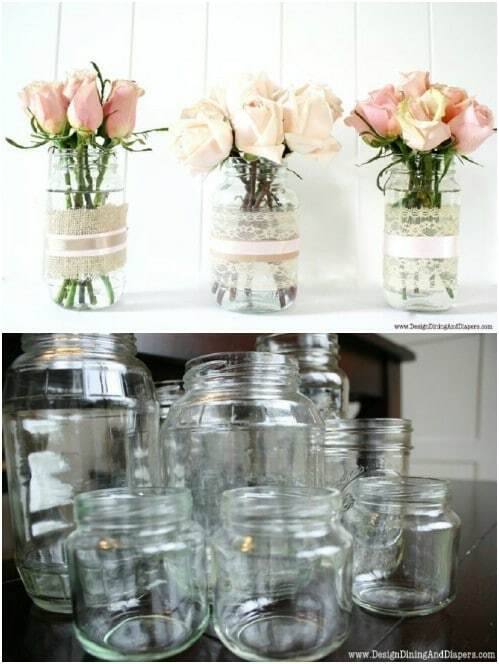 You need some glass vases or tall glasses or jars, a sheet of metal screen and a few basic working tools to make these. They’re simple and so gorgeous when they are finished. When you run out of your favorite nail polish, don’t automatically throw out that polish bottle. 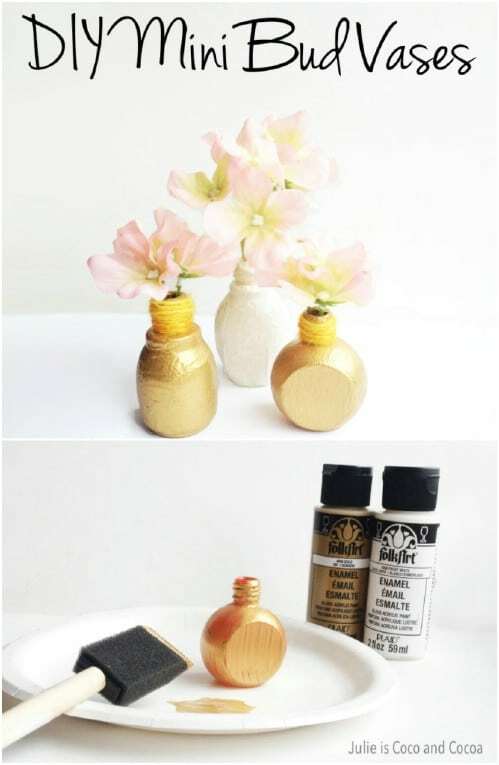 Instead, use it to create these adorable tiny bud vases. These are great for summer flower buds and are so very easy to create. 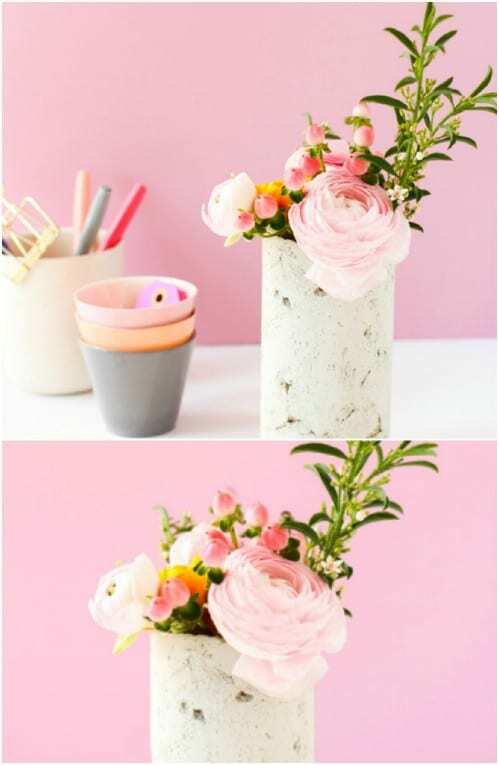 I love anything that repurposes trash into treasure and these little nail polish bottle vases are the perfect repurpose project for spring and summer! 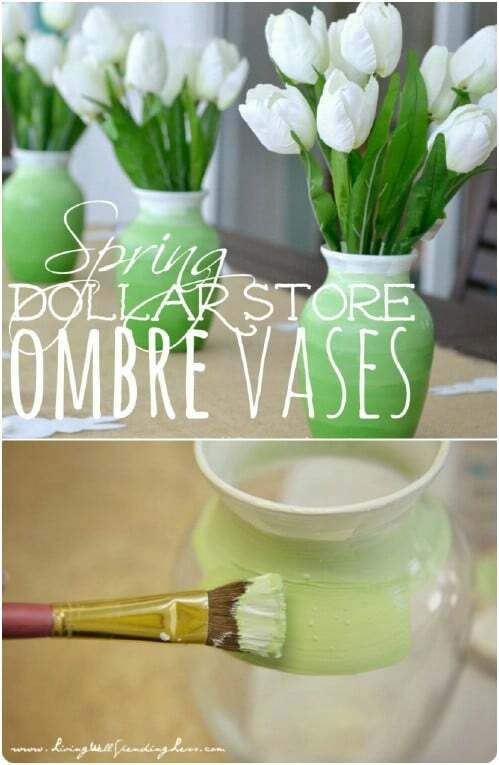 A really cheap vase from the Dollar Store and a collection of paints in different shades of the same color are all you need to create these lovely Ombre vases. These are super easy and you can do them in any color that you want. You could also do these in a rainbow of colors to really show off those summer flowers. And, you buy all of the supplies at the Dollar Store, so you know these are cheap to make. If you love DIY concrete projects, this vase is a must. You make this from concrete and it’s a really simple project. Don’t let the concrete fool you though, this is one gorgeous vase and when it’s finished, you could paint or otherwise decorate it however you want to really highlight those spring and summer flowers. Talk about cool DIY concrete projects! These DIY designer perfume inspired vases are gorgeous and they only take about five minutes each to make. You just need a rectangular or square vase or glass planter – or bowl – and you need to choose your favorite designer perfume. Just add the label and you’re done. These are perfect for your dresser and they have such a romantic look to them, don’t you think? birchwood and perhaps a woodburning kit to make the personalization. Or, you could check out these lovely ones that I found on Etsy. They’re just over $20 each and you can personalize them however you want. I love a good Pottery Barn knockoff project and these striped vases are about as easy as you can get for Pottery Barn inspired décor. These are cheap and easy to make and will only take you a few minutes each to create them. 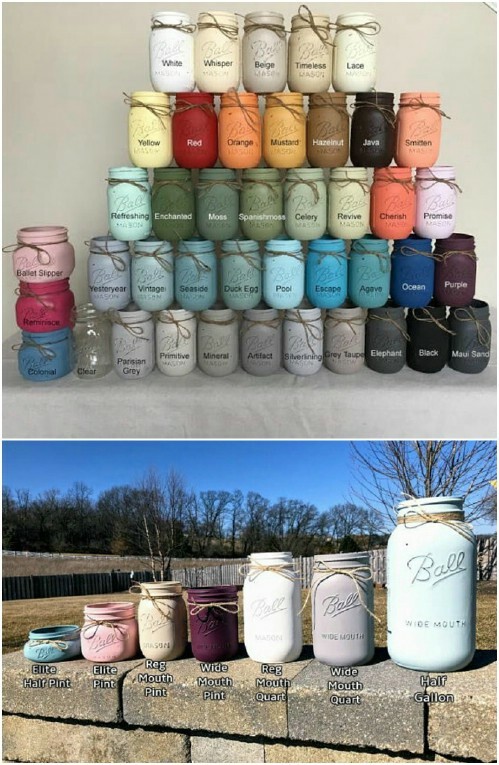 You just need your jars or vases, some paint and a few basic craft supplies to create these and they definitely rival their more expensive Pottery Barn counterparts. Okay, what could possibly be more summerlike than a snake? 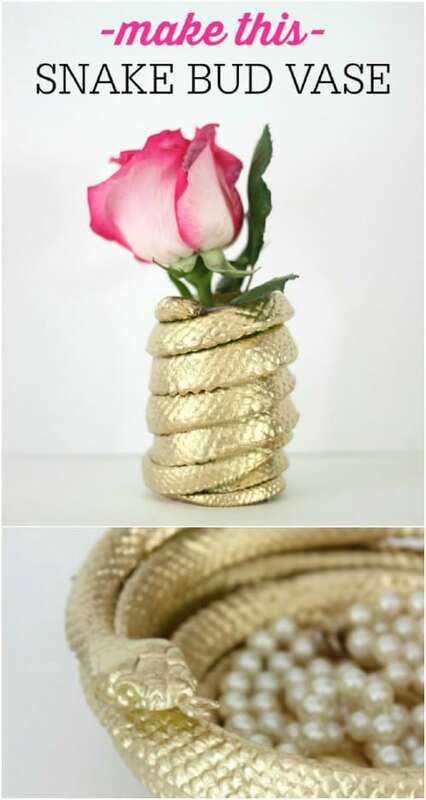 This DIY snake bud vase is perfect for showing off those summer flowers and it is really easy to make. If you don’t mind a snake in the house – at least a fake one – this is a great little vase project for you. You make this from one of those rubber snakes that you get at the Dollar Store for around a dollar and a few other crafty supplies and it’s a really whimsical and fun vase for summer. 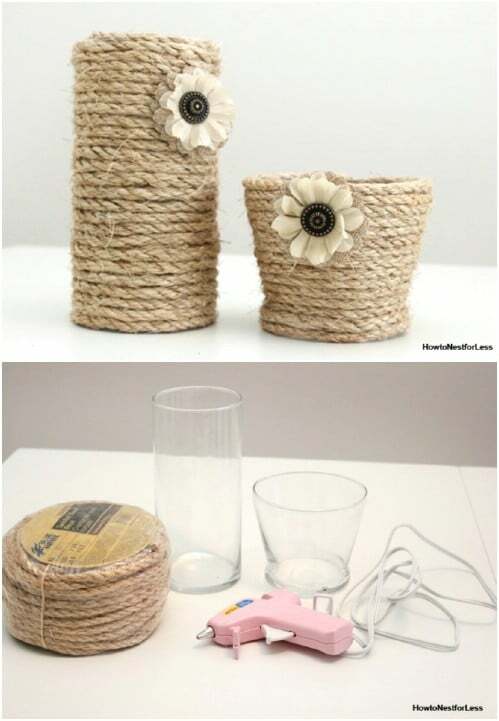 Sisal rope is a great material to work with and these DIY sisal rope vases are really simple to make. They have a great farmhouse like quality that is perfect for adding to your rustic décor and you can make them in any number of shapes and sizes to make showing off your summer flowers easy and beautiful. You just need rope, containers and a few basic craft supplies to make these. 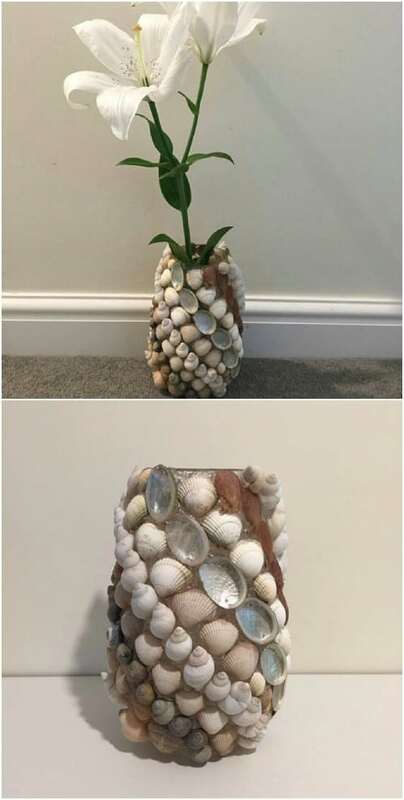 Seashells simply scream summer, which makes these easy to DIY seashell vases perfect for showing off those summer flowers. These are so simple to make and they’re really cheap, even if you have to buy your seashells from the Dollar Store or a craft store. If you have seashells from your last trip to the beach, you can use those and really save yourself some money. There are so many wonderful projects to create with seashells! These gorgeous DIY vases are dipped in marble swirl and they are gorgeous. You can do these in different colors to match different rooms, too. They are super easy to make and really cheap. 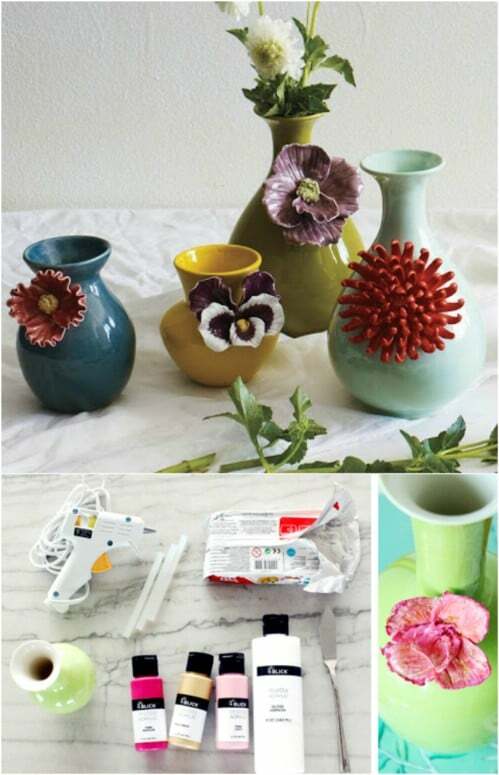 The only supplies you need are the vase containers and some paint and the process simply couldn’t be easier. You will love showing off your spring and summer flowers in these gorgeous marble dipped vases!